With an ideal climate year-round, Southern California is often referred to as a sporting paradise, where seemingly every sport under the sun has found a home. It shouldn’t be surprising, then, that soccer thrives under those conditions. California has produced more professional soccer players for the men’s and women’s game than any other state by a wide margin. From its mountains to the desert to the ocean, California’s natural playing fields are abundant and offer scenic backdrops for some of the top fields and facilities in the country. We looked at five of the best soccer sites around Southern California to see where the future of the sport in the state will play. The Championship Stadium at Orange County Great Park seats 2,500. With space for up to 24 soccer fields, the Orange County Great Park is a premier destination for tournaments. Six lighted grass fields include benches for coaches and players, 20 foot safety nets behind each goal and spectator viewing areas. The Championship Soccer Stadium features seating for 2,500 fans and includes locker rooms and training facilities, a box office, concession areas, an upper level viewing deck, berm seating areas and a recreation soccer field. Opened in August of 2017, the facility added a natural grass flex field in June of last year, which can hold four additional natural grass and six additional turf soccer fields. The facility hosted the Orange County College Showcase in March and will host the LA Galaxy Cup from April 17-21, as well as the Irvine Memorial Classic from May 25-26. The home of the San Diego Surf Cup, a three-tournament series now in its 35th year that brings more than 450 college coaches and scouts out to watch, SoCAL Sports Complex is one of the top venues in the region. Boasting 21 full-size playing fields on 52.5 acres of pristine playing surface and with an additional 25 acres of parking access, the complex also features on-site vendor areas to bring in food trucks and other vendors, providing healthy and locally-sourced options. Additionally, guests are welcome to bring their own food in. The complex has been hosting the Cal South State Cup on recent weekends and will be the site for the 2019 Surf Cup for teams aged U15 through U19 from July 27-29. Additionally, parts of the 2019 Man City Cup will be held at the complex from May 25-27 and the U.S. Soccer Development Academy will host its summer showcase and playoffs there from June 17-29. Fairplex Fields provides a gorgeous natural background for your tournament. The LA County Fair calls Fairplex home, as do some of the top soccer fields in the state. With 487 acres available, Fairplex installed four recent professional, FIFA-regulated, lit grass soccer fields that are adaptive to unique playing styles. Two fields sport natural grass, while the south field is covered with Bermuda grass and the north field uses perennial rye grass. There’s room for 10,000 spectators in the grandstands at Fairplex, which has hosted the Cerritos Memorial Challenge tournament in the past, bringing some top competition not only from Southern California and the surrounding states but also from France, Mexico and Canada in recent years. The Southern California Sports Club (SoCal SC) plays its home matches at Fairplex, which plans to add two more fields in the near future. An incredible 35 fields designed for soccer but adaptable for multi-sport use have made the Lancaster National Soccer Center the largest soccer complex in the West. 11 of the fields are fully lighted, while five fields have met the international FIFA qualifications for turf quality. The facility has maintained an excellent relationship with Cal South Youth Soccer and routinely hosted Cal South State Cup Tournaments throughout this spring. Additionally, the AYSO Region 91 American Heroes Cup was held here in Mid-March, as well as the AYSO All Star Playoffs in January. SilverLakes Sports Park blends soccer with an equestrian venue and concert space while housing a restaurant, The FieldHouse. SilverLakes Sports Park’s mission is to give its guests the highest level “Wimbledon-experience” for tournament activities, curating an amazing experience in a unique atmosphere that blends soccer and equestrian pursuits with concerts. The complex offers 24 full-size soccer fields, including four LED lit synthetic fields. An on-site 150 seat restaraunt called The FieldHouse, as well as a private banquet facility for 200 people called The Fieldhouse Terrace enable guests to relax during or in between games. The complex will host the Cerritos Memorial Challenge Cup, presented by Nike, during Memorial Day Weekend this year (May 25-27). 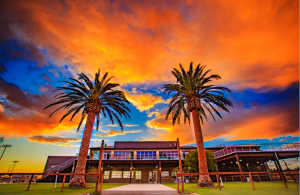 Later this summer it will also host Summer Cup 2019 (July 20-22) and the third annual SilverLakes Summer Showcase (July 26-28), bringing some of the top competition in the West and internationally to Corona. We looked at five of the best soccer sites around Southern California to see where the future of the sport in the state will play. Get ready for a game born from two of the most popular sports in the world that’s fun, different and on the rise. The name of the game is FootGolf, where you combine your soccer and golf skills on a golf course.